Good day to everyone! Hope you all are enjoying a nice steaming cup of coffee on this chilly fall morning. For those of you that work please be careful on the road, and for those of you that do not work, grab a good book and relax. However, did you all know that not everything is in a book? Take a look at today’s optical illusion, and you all may notice something very obvious about this image. Do you all see the words that are made out of books? 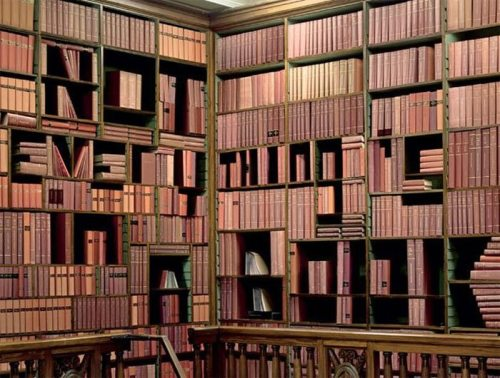 This is a really cool optical illusion because it had to be hard to make an illusion out of all these books. While it is true that not everything is in a book, the fact is that many things are, and people should read as many books as they can, because after all, knowledge is power! Ready for another fun optical illusion? Take a look at these optical illusions all about Yosemite! There is an old saying that sometimes life depends on your point of view, and these images really do take that old saying very seriously. All of these images are done with force perspective, and they are a lot of fun. Hope you have a good day everyone and we will talk again tomorrow.